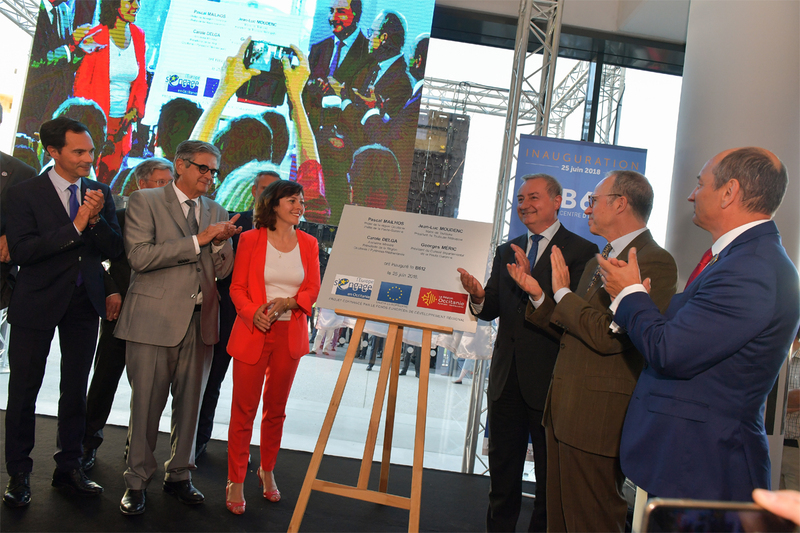 B612 was inaugurated on Monday 25 June in the presence of Antoine de Saint-Exupéry’s descendants, the building’s financiers, the first member occupants and many companies involved in the aerospace and embedded systems sector. Pascal Mailhos, Prefect of the Occitanie region, Jean-Luc Moudenc, Mayor of Toulouse, President of Toulouse Métropole, Carole Delga, President of the Occitanie / Pyrénées-Méditerranée region, and Georges Méric, Chairman of the Conseil Départemental de la Haute-Garonne [County Council of Haute-Garonne] unveiled the building’s inaugural plaque, after heralding its innovative character both with regard to its architecture and the players and activities it houses. It took two years and more than 65 million euros for the semi-public company Oppidea to construct this 24,500 m² building complex, which was designed by the firm Kardham Cardete & Huet Architecture.